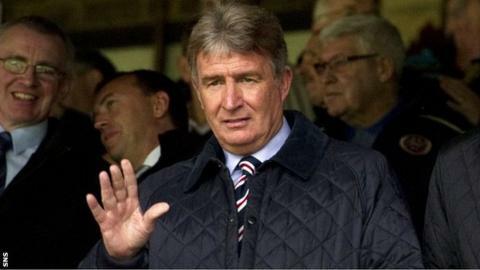 Former Rangers, Hearts and Scotland defender Sandy Jardine has died at the age of 65. Rangers confirmed that Jardine had lost an 18-month battle against cancer on Thursday evening. He was part of their European Cup Winners' Cup-winning team of 1972 and played 38 times for his country. Ibrox manager Ally McCoist said everyone at Rangers was devastated at the loss of "a legend" and "a great man". And the club said their thoughts were with his wife Shona, children Steven and Nicola, his grandchildren and friends. Hearts also extended their condolences to his family, with the Tynecastle club adding they were deeply saddened at the death of a club legend. Edinburgh-born Jardine began his career with Rangers in 1965 and went on to make over 600 appearances for the Ibrox side. As well as playing in the club's European triumph in 1972, the full-back won three top-flight titles, five Scottish Cups and five Scottish League Cups with Rangers. A move to Hearts followed in 1982 and, along with former Rangers team-mate Alex MacDonald, he was joint-manager at Tynecastle between 1986 and 1988. Under their command, the Edinburgh club lost out on the Scottish title on the final day of the 1985-86 season, Celtic taking advantage of Hearts' defeat at Dundee to pip them to the crown. Jardine's on-field contribution that term was such, though, that he was named Scotland's player of the year for the second time at the age of 37. The honour came 11 years after he first won the award. After his playing career ended, he returned to work for Rangers in various roles. In November 2012, it was confirmed Jardine was being treated for cancer. "He was respected not only by Rangers fans but also the wider football community and he is a huge loss to the game," McCoist said on Rangers' website. "I had the privilege of watching Sandy playing for Rangers when I was a young boy, I had enjoyed the pleasure of working with him closely since I returned to the club in 2007 and he was a truly remarkable human being. "His achievements both on and off the pitch are second to none and I was honoured to regard him as a friend. "He gave everything for this great club and worked tirelessly in a number of roles because he wanted to ensure the traditions, history and standards at Rangers were maintained. "He recently told me he was proud to be a Ranger and wanted to be remembered forever as a Ranger. Well Sandy, you will go down in history as one of the greatest of all time and we will miss you terribly." During his time at Ibrox, Jardine was a team-mate of Sir Alex Ferguson. The former Manchester United manager and his wife, Cathy, added their own tribute. "From Cathy and I, this is some of the worst news we have heard," he said. "Sandy was a noble and courageous man. "The respect he is held in at Rangers is immense. He was one of the greatest players ever to wear the jersey. To Shona and family, we express our sympathy and sadness." Jardine's international career spanned nine years and included appearances at the 1974 and 1978 World Cup tournaments. He captained his country on nine occasions. Campbell Ogilvie, the Scottish FA President, added his condolences. "I am extremely saddened by the news of Sandy's passing," he said. "I have known him for more than 40 years and found him to be as warm and courteous off the field as he was reliable and elegant on it. "As well as being a talisman for both Rangers and Heart of Midlothian during an illustrious and enduring playing career, he was also a terrific servant to the Scotland national team." Celtic chief executive Peter Lawwell also paid tribute to Jardine. "This is absolutely devastating news," he said. "He was a very fine man and it was a privilege to know him. Sandy was widely respected across the game and he will be sadly missed by us all."